If you’ve been thinking of relocating to China and growing culturally or professionally there, but are still unsure about where to go, have a peek at all the good reasons why Xiamen, a city on the southeast coast, should be among the eligible places to live in. Xiamen is still not as famous among China-lovers as Guangzhou or Shanghai, but I’ve heard many non-Chinese friends talking about it as the best place they’ve lived in China, and I stayed there for six years myself. 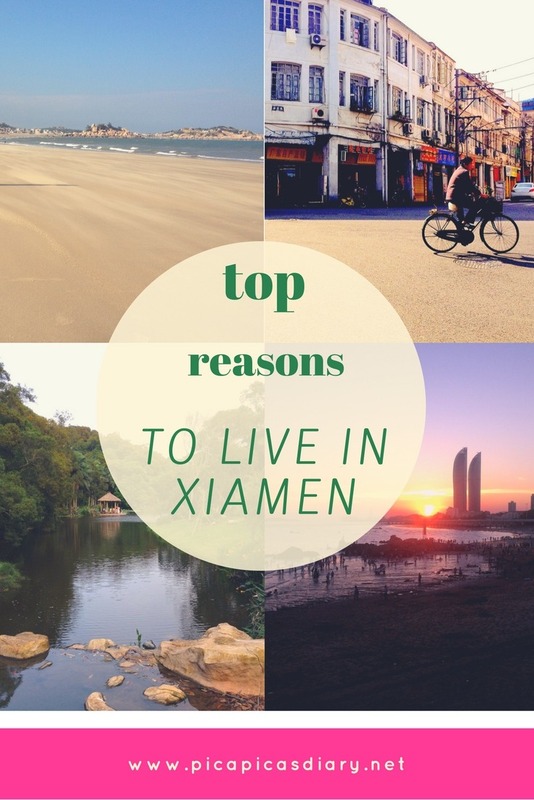 Here are some of the reasons why people fall in love with Xiamen. Xiamen has subtropical weather. It will allow you to go out in sandals and t-shirt up to December. There are a couple of months of mild cold and wind every year, just to remind you what it means to wear a jacket. Mostly you will have sunny days with amazing sunsets, especially from August to November. The climate is hot and humid. There are a few weeks of constant rain, usually after the Chinese New Year. Taking advantage of the warm, enjoyable weather, locals engage in the custom of spending time in the streets drinking tea. You’ll watch them also playing chess, exercising (tai-ji, dancing, long walks), eating snacks and, most of all, laughing loudly. Xiamenese are “southern people”, and have a rich local tradition they are proud of. The local dialect is also the local language of Taiwan. I’d say in Xiamen you experience an amazing mix of Chinese and South-East Asian cultural vibes. Locals talk worlds to you and ask a lot of questions. They smile often and show their feelings, and will expect you to do the same. Xiamenese are eager to connect and to experience that connection and friendship to the fullest. The main town and historical center of Xiamen are on the island of the same name, which is connected to the mainland by beautifully designed bridges and an underwater tunnel. Half of the perimeter (Huangdao Road), starting in the proximity of Xiamen University, is surrounded by a walkable path on the beach and a bike trail conceived for sports activities and spending time looking at the sea. The lush subtropical vegetation overflows from rooftops, bridges, rocks, and private and public gardens. The massive limestone blocks which form the island offer opportunities for climbing and observing the beautiful coastal landscape. The city hosts a huge botanical garden and temples with nature walks. Due to its past as one of the first harbours where foreign trade and residency were allowed, and thanks to the investments of the overseas Chinese launched during the government of Deng Xiaoping, Xiamen is one of the richest cities in China. It is common to see families with more than one child, and Xiamenese love that their children study English. Bilingual kindergartens abound. If that is the kind of job you are looking for, it won’t take long before a school hires you. There’s no possibility of feeling lonely or isolated in Xiamen. Locals are friendly and there are plenty of places to get together. There are clusters of pubs and bars throughout the city; the well-known areas around the Marco Polo Hotel and Haiwan Park and the recently developed Minzu Road and Daxue Road near Xiamen University´s main campus are a sequence of cafeterias, beer stations and food shops for any taste. You’ll never stop discovering new attractions! Just as the foreigners found this Fujianese island-city a convenient harbour to conquer during the XIX century, they still make use of it today. If you need to leave China periodically for Visa reasons, you should know that in Xiamen you can get a 30-minute ferry ride to the Taiwanese Island of Jinmen. In Jinmen, you can get a stamp in your passport and be back to Xiamen within two hours. You left and entered again China without too much hassle and saving a lot of money. Xiamen is also a convenient starting point for exploring South-East Asia. Manila, Bangkok and Jakarta are just a few hours away. The train ticket to Hong Kong is around 20 Euros for a 5-hour trip. If you are still uncertain, plan a short trip to Xiamen first, and see if your impressions match mine! Did this article inspire you? Share it! What did you do in Xiamen? I lived in Shanghai for 4 years and made a couple of trips there and did really appreciate the much milder climate. From your post it also sounds like the people there are much more open, it’s something I struggles with in Shanghai, but there were also so many things to love there! I worked as an Italian and English teacher and studied Chinese. I did a couple of weekends in Shanghai and loved it, especially foodies, it’s a city that should never be skipped on a trip to China! Xiamenese are special, I guess it’s the weather and the fact they live on an island. If the weather is good – I AM THERE. This is basically the MAIN reason I live in Los Angeles and could never see myself moving anywhere else. The coldest degree I can handle is about 50! haha! I’ve never been to LA. I know it from one of my favorite movies, the Big Lebowski 🙂 however… it’s on my bucket list! My first to hear of it. One reason why I love blogs. It’s awesome to get introduced to new places. Wow, this place looks gorgeous. I am not sure I could live there, but traveling there for a visit would be incredible. The weather and the great outdoors would be reason enough for me to want to live here. I’d love to retire somewhere, where the weather is more suitable than it is here. Hi Terri, where are you staying now?